The AuroraWatch UK team let users know about the new app via social media and email. Lancaster University were also kind enough to feature the app on their news feed (Catch the Northern Lights with your mobile). One thing that became quickly apparent was the number of users who were using the iPhone app on an iPad. 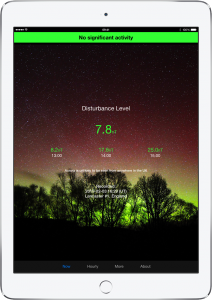 We are pleased to announce that AuroraWatch UK is now fully iPad compatible. All those who are already using the app on an iPad will get the update! Whilst updating the app, we also took the opportunity to add a few other new features. View the previous 3 hours data on the main screen to get a feel for any period of activity. View a 30 minute Ovation Model forecast via the More tab. Join the many happy users in receiving free real time Aurora Borealis (Northern Lights) alerts from AuroraWatch UK on your iPhone and iPad now?